But have you ever wondered what the technology involved in their design and operation would need to be and could they conceivably be built using existing tech? Shall I get out and push? Ion drives, thrusters or boosters are part of a class of solar electric propulsion (SEP) engines whereby ionized propellant is focused out the back of the engine, creating a stream of ion jets known as an ion beam. The movement creates the thrust that moves the craft. This technology is currently in use on satellites and probes such as Deep Space 1. So far so good but…. There is a similar principle called electrohydrodynamic thrust, also called ionic wind, which was first recognized in the 1960s. Ionic thrusters are simple in design. They feature one thin copper electrode, known as an emitter, and one thicker tube of a metal-like aluminum called a collector. A lightweight frame supports the wires, which connect to an electrical power source, and keeps them apart—the gap between them is vital to creating ionic wind. When a voltage is applied to the wires, the resulting field gradient pulls electrons away from surrounding air molecules, ionizing them. The ionized air molecules are strongly repelled by the emitter and strongly attracted to the collector. As they move toward the collector, they push the other air molecules around them, creating thrust. Designers say they have the potential to outperform current jet engines. Ionic thrusters are silent and because they give off no heat, are completely invisible to infrared sensors. However, they may potentially require atmospheric concentrations of molecules to function. 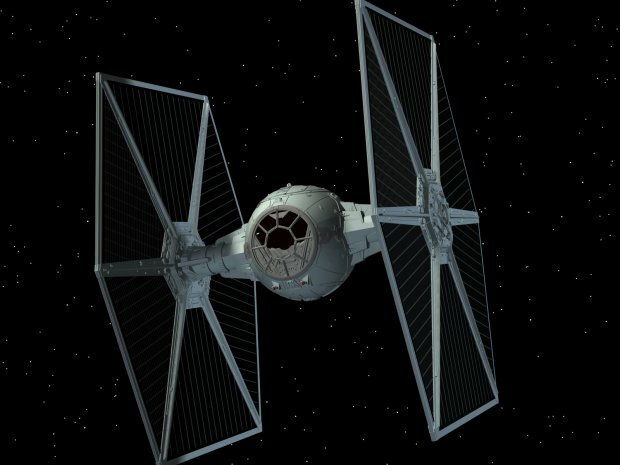 Craft in the TIE Fighter series are usually armed with one or more “laser cannons”. More advanced versions are equipped with a variety of warhead launchers, for instance. The use of the term “Laser cannons” in Star Wars is a little misleading as they should actually be thought of as plasma weapons. In most sci-fi films, especially Star Wars, “laser” shots are visibly bright and form “blobs” or “bolts” of energy. This would be more in line with plasma weapon discharges, rather than focused light. Since lasers don't radiate energy away from their direction of travel, the bolts cannot be lasers. Also, laser cannons have physical holes at the ends of their barrels. Since a laser should have a lens at its end, this indicates that some “physical” object is exiting the barrel. Plasma weapons fire a beam, bolt, or stream of plasma, which is an excited state of matter consisting of atomic electrons, nuclei, free electrons if ionized, or other particles if pinched. But aren't plasma weapons just in films and games? This tech is currently under development with projects such as Shiva Star, which was also used to develop an experimental weapon known as MARAUDER for the SDI effort between 1989 and 1995. The idea appears to have been to create compact toroids of high-density plasma that would be ejected from the device using a massive magnetic pulse. The plasma projectiles would be shot at a speed expected to be 3000 km/s in 1995 and 10,000 km/s (3% of the speed of light) by 2000. A shot has the energy of 5 pounds of TNT exploding… Cool! So there's potential here, the weapon platforms just need to be minimized to fit the frame. We would also need to make them efficient enough to be powered by the relatively small power supply of the fighter...I believe I can fly…. The iconic “wings” of the tie fighter series are often cited as solar panels, but this may not be true. Star Wars fans often site craft as having power cores with the wings acting as cooling vanes for this core. However, the common view is that they function as solar collectors for the craft. Both tech principles (apart from power core, unless nuclear fission of course) are common practice today so we can give this a big tick. Clearly, the wings would be useless in atmospheric flight for aerodynamic purposes, but given that most craft in Star Wars have some form of anti-gravity tech, their use as conventional wings is irrelevant. Ion engines exist but lack the thrust to provide the agility seen in the films and their limitations would rule them out as a viable propulsion system for the fighter’s maneuverability at our current tech level. Plasma weapons are functional in principle but would require extensive development to reduce the size to fit a small space craft. And finally, Star Wars type anti-gravity tech is far from close to being developed. But hey a boy can dream.